and then proceeds to support it with a devastatingly detailed brief. independent expenditures, including those made by corporations, do not give rise to corruption or the appearance of corruption. 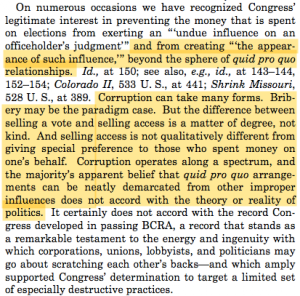 ….That key argument of the right-wing justices in Citizens United has now become the key argument of the Clinton campaign….Clinton supporters in 2016 are denying the corrupting effect of direct campaign donations by large banks and corporations and…huge speaking fees paid to an individual politician shortly before and after that person holds massive political power. ….Clinton supporters insist, the mere fact that a candidate is receiving millions upon millions of dollars…from Wall Street banks, hedge funds, and large corporations is not remotely suggestive of corruption…. [they] have resorted to denying what was once a core orthodoxy of Democratic politics: that big corporate donations (let alone being personally enriched by huge Wall Street speaking fees in between stints in public office) are corrupting. One more merger point between ‘right’ and ‘left,’ conservative’ and ‘liberal.’ That’s a ‘bipartisan consensus’ to look forward to, especially when the Republican Party will gleefully point to this claim being made by Democrats. The most salutary effect of this abominably long election season has been the simultaneously gratifying and dismaying confirmation of the utter corruption of the political process, and the concomitant need for a radical–you may, if you prefer, call it ‘revolutionary’–transformation to be induced in it. What we have simply won’t do. 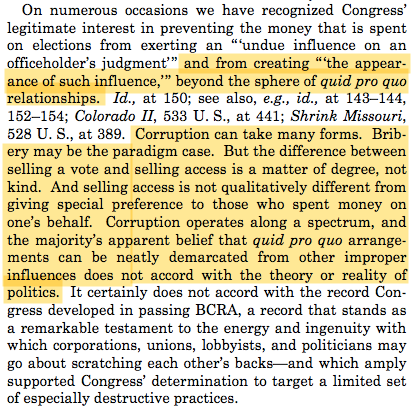 This entry was posted in Law and Legal Theory, Politics and tagged 2016 elections, campaign finance, citizens united, corporate influence, corporate power, corruption, Democratic Party, Glenn Greenwald, Goldman Sachs, Hillary Clinton.